The death of Jonghyun, the talented main vocalist of SHINee, sent shock waves among fans and peers that resonated throughout the country and the K-pop scene. Jonghyun, whose real name was Kim Jong-hyun, was found in a rented studio apartment in Cheongdam-dong, southern Seoul at 6:10 p.m., Monday. The 27-year-old singer had suffered a cardiac arrest upon discovery and was taken to a nearby hospital, but was pronounced dead after attempts to revive him failed. Police confirmed Tuesday that his death was a suicide, saying they would wrap up the case after talking to his family. 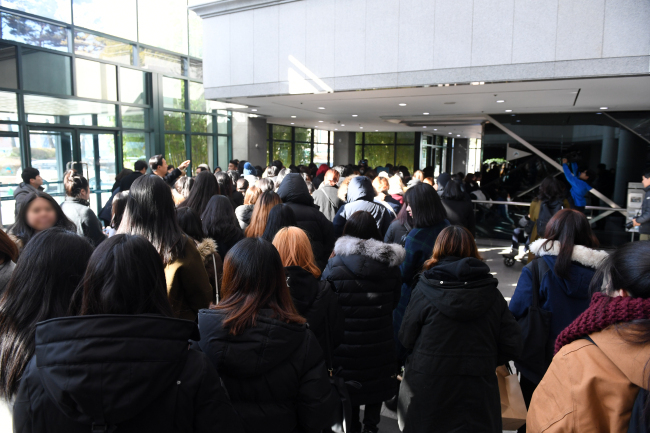 A memorial service was held for him at the funeral hall of Asan Medical Center in Songpa-gu, Seoul, prior to the funeral that will be held on Thursday. 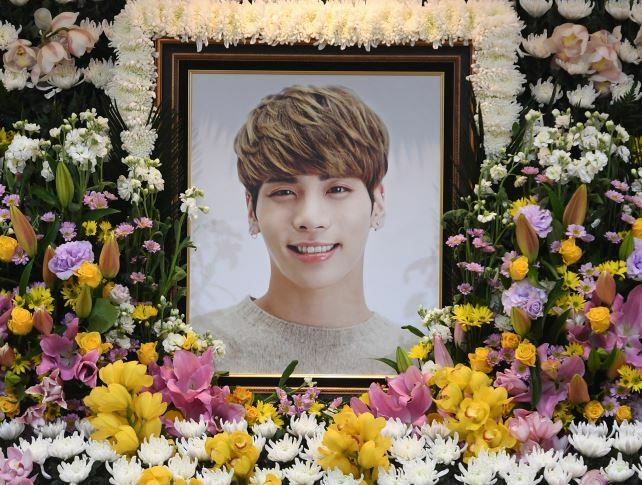 Jonghyun’s SHINee bandmates Onew, Key and Minho received the mourners. Among those present were S.M. founder Lee Soo-man and his artists BoA, members of Girls’ Generation, EXO and NCT. Hundreds of fans flocked to the memorial venue to offer their condolences. Many fans wept in silence, and the few who broke out wailing were consoled by fellow fans. “I couldn’t think of anything (when I heard the news). 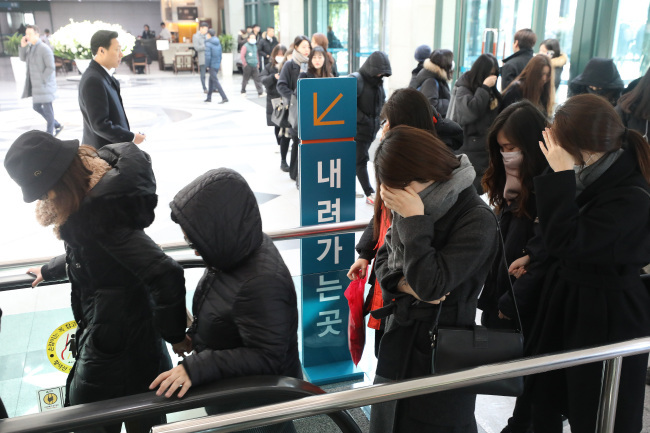 Actually, though I saw (funeral altars) there but I still don’t feel it’s real,” said Im Hye-rim, a 27-year-old fan. She said she felt as if she was close to the late singer. Valentina, 24-year-old from Chile who had been a fan for eight years, said that she never imagined such a thing could happen. “I even went to his concert recently. We (the fans) always knew that he was sensitive but. ...,” the tearful fan trailed off. On Tuesday, Jonghyun’s agency S.M. Entertainment paid tribute to him in a message on its official social media page. “Jonghyun was the best artist who loved music more than anyone else, enjoyed the stage, and liked communicating with the fans through music. We will remember him forever,” it wrote. Thousands of fans wrote words of goodbye in different languages. Fans were further torn at the evidence that showed how much the singer had suffered before making the tragic decision. In the posthumously revealed will -- which Jonghyun had sent to his close friend Nine9 of the band Dear Cloud -- laid bare the serious state of depression he suffered. “I was broken from inside. The depression slowly chipped me away, finally devouring me,” he wrote. Jonghyun indicated that he sought medical help for his depression to no avail. Nine9 said that she and Jonghyun’s family agreed that the letter should be revealed to the public. “I’m concerned over possible controversies, but I think he (Jonghyun) expected that when he asked (me to take the letter). I decided to do the last thing I can do for him,” she said. Having debuted in 2008 as the main vocalist for SHINee, Jonghyun has been noted for his singing, dancing and songwriting skills. His solo career was also a success, having been nominated for the best male artist award at the 2016 Mnet Asian Music Awards. Jonghyun was onstage just days before his death, having wrapped up his solo concerts in Seoul last week and pre-taped a segment for a cable show “Night Goblin” that was to be aired Sunday. SHINee was also scheduled to hold concerts in Tokyo and Osaka in February. Local media quoted his acquaintances as saying that he was also working on a solo track and had recently purchased a car. Jonghyun’s untimely death sparked calls from the fans to S.M. Entertainment, urging it to take better care of their artists. The K-pop artists, particularly from leading agencies, are said to undergo tough training and hectic schedule from very young age. “S.M. please take care of your idols and artists from now on. ... Remember they are more than your source of income, your money-generator, they are humans, too. There might be someone in your company facing the same demons Jonghyun battled. In the whole industry too I’m sure. Please acknowledge depression as a serious issue and be the first one to step up and make a change,” a fan named Veronica wrote on S.M.’s official Facebook page.